GUY En gineering Services, Inc. is pleased to announce that Vice President and Senior Civil Engineer Rebecca Alvarez has been selected as the 2017 Young Engineer of the Year by the Oklahoma Society of Professional Engineers. 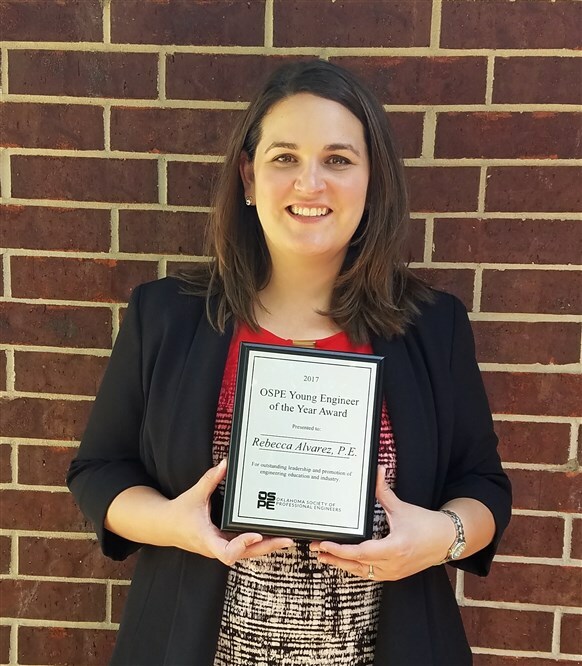 Each year, only one Young Engineer of the Year is selected for Oklahoma, based on educational and collegiate achievements, professional and technical society activities, civil and humanitarian activities, professional experience, and achievements within the field of engineering. This is the third year in a row that an engineer from GUY Engineering has received this honor. Alvarez holds a Professional Engineer license in Oklahoma, Arkansas, and Texas. She is also a Certified Floodplain Manager and holds ADA certification. In addition to her engineering accomplishments, Alvarez is passionate about community outreach. As a member of Engineers Without Borders for seven years, she was instrumental in designing and placing composting latrines in communities in Bolivia. Alvarez has also been a member of the Board of Directors of Engineers in Action (EIA) since the non-profit was formed in 2008. EIA provides engineering services and logistics to teams working in Bolivia and Ecuador. EIA has been involved in over 50 different Bolivian communities, improving the lives of thousands of people. Alvarez has been involved in literally every facet of EIA – from collecting the mail to leading the board of directors. She has also traveled to Bolivia seven times herself. On one trip, she met her now-husband, Joe, who was a project manager for EIA. Joe has since moved to the United States, where he also works as a civil engineer. “It’s a privilege to work in a profession where we are able to impact people’s lives every day, whether that is a new bridge or preventing homes from being flooded. Being an engineer is both rewarding and fun.” said Alvarez. Alvarez continues to work in her community and to serve the public of Oklahoma. She is honored to have the opportunity to improve lives and safety though her work improving Oklahoma’s infrastructure.